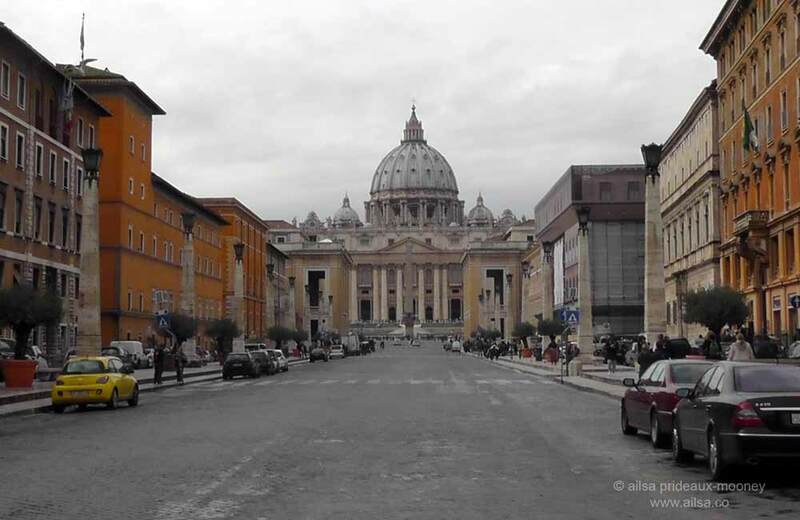 A funny thing happened on the way to the Vatican | Where's my backpack? I was almost at the end of my visit to Rome and Vatican City seemed to be getting impatient with me for not having visited straight away. The great dome of St Peter’s Basilica floated defiantly into sight over rooftops, down alleys, through keyholes, every time I took a photo. “I’ll get to you,” I promised inwardly. “I’m just too busy right now with the Roman Forum, rose sellers, orange groves, scenes from Roman Holiday and following the Grand Tour footsteps of literary masters.” On my second last day in the Eternal City I was finally ready and made my way over the Tiber, past Castel Sant-Angelo and down the cobbled street towards Vatican City. I had my day all planned out in my head. 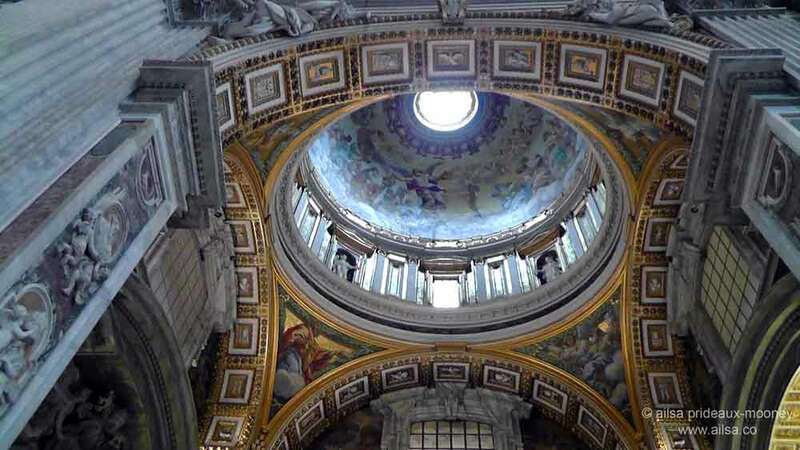 First I would take a wander around St. Peter’s Basilica, then pop out and watch the changing of the Swiss Guard before heading into the Vatican museums to marvel at the ceiling of the Sistine Chapel. Guide books had all warned of long lines to get into the basilica but I only had a brief five minute wait which I spent watching a pair of Swiss Guards refusing entry to a couple of nuns who seemed to be on a mission to sneak in a side gate. That’s how the story seemed to be playing out in my head anyway, but before I could see how it ended I was ushered into the basilica and was swept up in the spectacle of the interior. I never expected it to be so vast, so colourful, so ornate or so crammed to the rafters with art. Read all you want about the basilica, look at as many photos as you like, but nothing can prepare you for the overwhelming resplendence this place exudes. There really was too much to take in all at once; and far too much to try and capture in a photograph, so I contented myself by picking out details and finding odd angles to focus on one exquisite object after another. 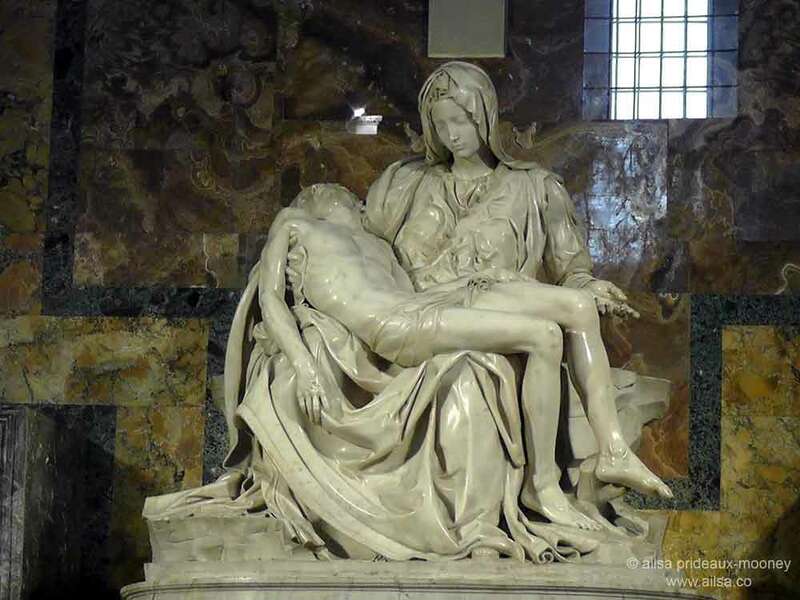 I was brought to a standstill by Michelangelo’s Pieta. Again I was taken unawares, not expecting to be quite so moved by this iconic sculpture. 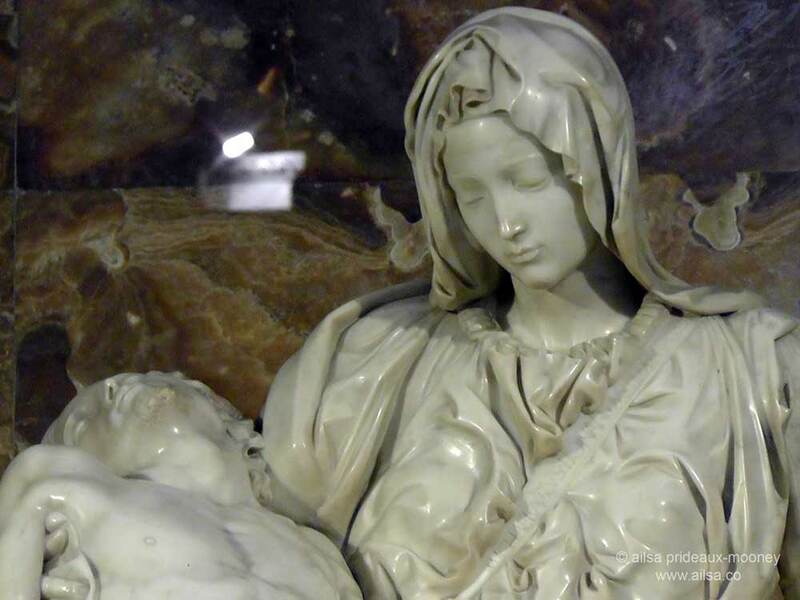 It’s hard to comprehend how a young man of 23 had the life experience to capture the expression on Mary’s face as she sits holding the broken body of her dead child. Intellectually, this sculpture is clearly religious; however its physical presence is intensely, divinely, compellingly human. I had lost track of time inside the basilica and decided to venture outside and over to the Vatican museums, but a passing tour guide informed me the museums were closing early due to a holiday or holy day; his accent was thick so I couldn’t tell which he had said; mind you holiday and holy day were probably one and the same thing within the confines of Vatican City. 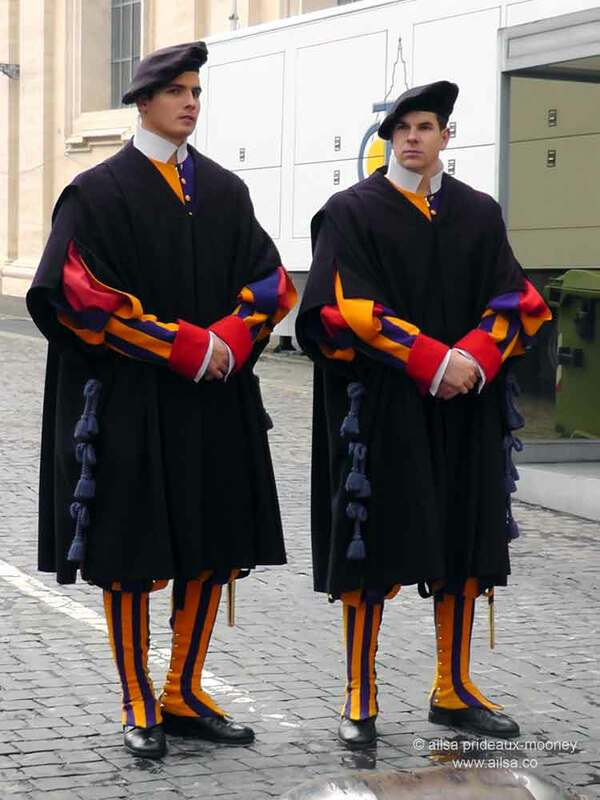 Instead, I settled for a quick peek at the Swiss Guard standing duty outside the basilica. There was another 20 minutes before they were due to perform their Changing of the Guard, so I thought I might wander out into the square for a look around. 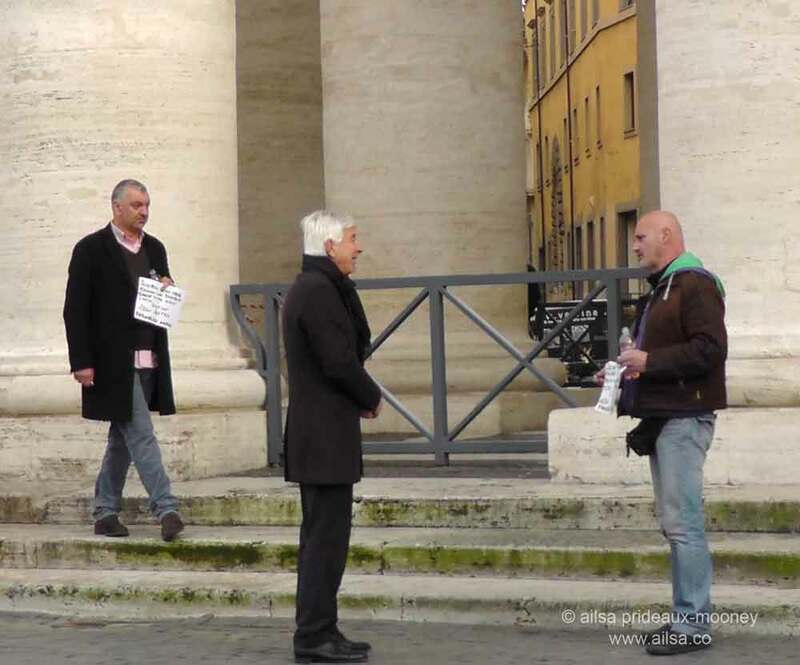 Just as I was thinking that, a white-haired gent dressed all in black sailed past the Swiss Guard with a confident swagger reminiscent of Tom Jones in his heyday. The men on duty almost curtsied out of respect as he passed by so I figured he must be someone of note. He hurried towards the square and I followed along at a distance, intrigued by his demeanour. In the square a small group were gathered watching two men pace up and down steps in front of the colonnades. The holy Tom Jones chap skirted around the small group, talked to some official looking entities off to the left and then engaged the two men in conversation. Things got rather heated very quickly. 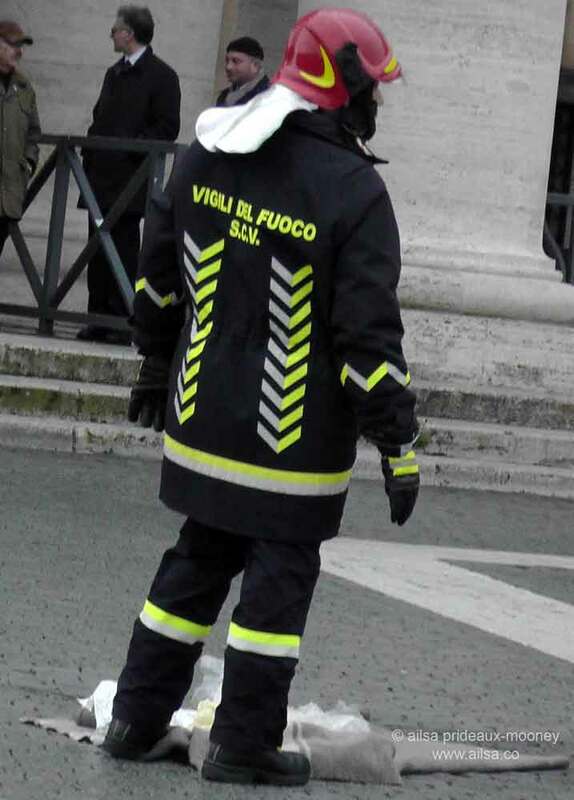 The men were carrying bottles of gasoline and lighters and were threatening to self-immolate if they weren’t granted an audience with the Pope. Most of the people around me were Italian and took turns trying to talk to the protesting men but they were getting more and more upset with each person who tried to talk to them. At several points they launched into great, impassioned and clearly vitriolic diatribes. I don’t speak Italian but I understood the sound of true anguish in their voices. An Italian girl next to me, her hair in thick braids stuffed under a knitted hat, was trying to explain the situation to a tourist from Nebraska; speaking of mass corruption in the government and mass unemployment throughout the country. She said these men had lost their jobs and had no way to provide for their families; appealing to the Pope was in their minds a last resort. Things were turning worse now; the men hurled insults at Tom Jones who retreated back towards his official friends. New faces showed up amongst the small crowd, faces that looked well-versed in military operations. Policemen began cordoning off the area with little orange traffic cones and red and white tape. I looked around; they had cordoned off the whole square leaving us huddled inside. Camera crews from television stations had started to gather at the roadside outside the cordons with their cameras trained on the action. I looked back towards the basilica, thinking perhaps it might be a good idea to put some distance between me and the bottles of gasoline. Walking back towards the Swiss Guard I saw the tail end of the Changing of the Guard and stopped, undecided as to where I should go next. I turned around towards the square again. The crowds leaving the basilica were being funneled off to the left out of the way so I started towards them, but an official gent on my right smiled at me, removed a barrier rope and waved me through under the colonnades on the right. I smiled at him and obliged, climbing the steps not entirely sure where I was going. 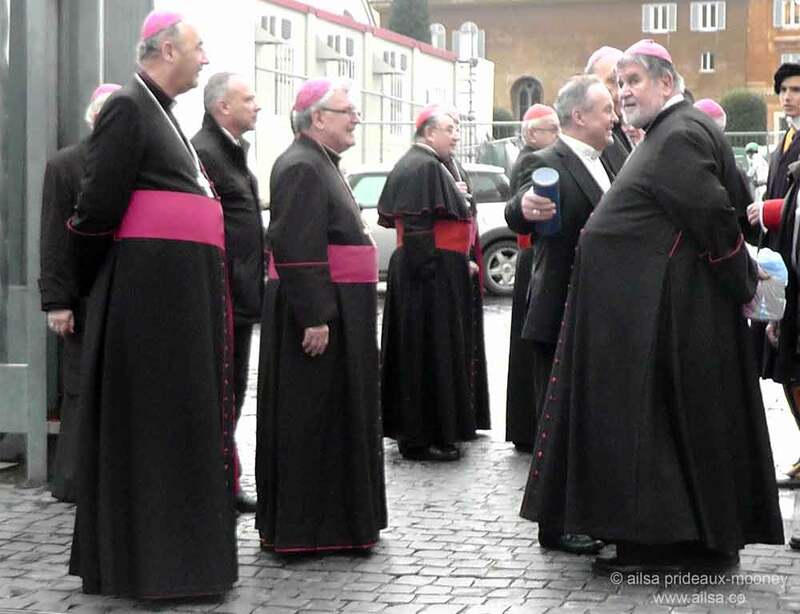 When I turned around to inquire, I was overrun by a flock of cardinals in purple sashes and caps. There were hordes of them, all moving en masse (pun not intended) in my general direction, accompanied by camera crews. …until someone, somewhere, decided it was time for the cardinals to be elsewhere. 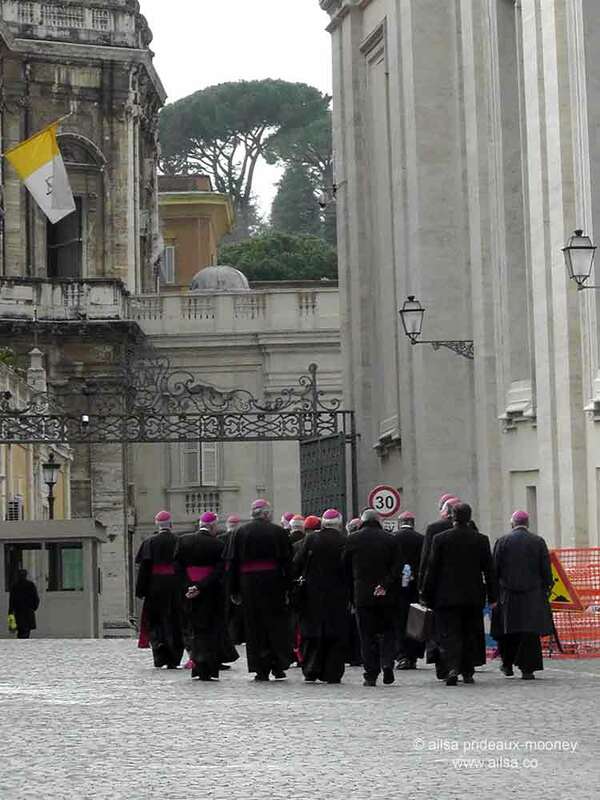 Like a murmuration of starlings the cardinals turned as a man and flowed past the guards, fluttered through the courtyard and disappeared out of sight underneath a distant archway, leaving the camera crews, the Swiss Guard and me standing around in uncomfortable silence. I took one last look towards the vanishing cardinals and then turned to follow the camera crews but they had already gone. I turned to the Swiss Guard with a look of incredulity and bewilderment and threw my hands up in a gesture that I hoped would let them know I had no idea where to go next. I giggled again at the absurdity of it all, I couldn’t help myself. 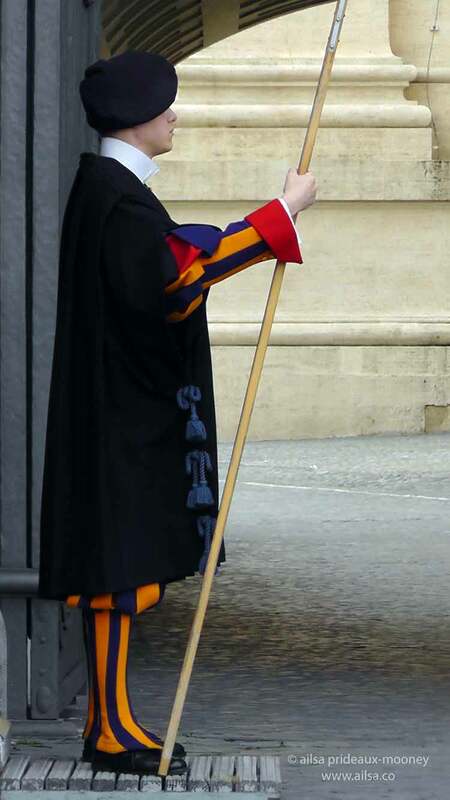 One of the guards obviously took pity on my plight, for he uncharacteristically cracked a smile (seriously, have you ever seen a Swiss Guard smile?) and pointed me in a direction. “Thanks” I waved awkwardly and shot off under the columns, ending up back in the square almost on top of the protesters again. Firefighters stood by with what looked like blankets ready to extinguish any flames that might arise. Something was about to happen, you could feel tension rising and energy seemed to coagulate in the air around the square. I felt small beads of sweat rise in prickles down the back of my neck and I wanted to be anywhere but here, but I stood transfixed like a stunned rabbit, unable to move, scarcely daring to breathe, waiting. My phone rang, shocking me back into action; it was my friend Karen who I was supposed to meet for dinner. “How was the Vatican?” she asked. “Umm, not what I expected,” I backed away from the firefighters and not-so-secret service agents who were moving in on the protesters. “Hang on, I’ve got to find a way out of here,” I ducked under some red and white tape and spotted an exit out of the square. Still on the phone, I pushed through a cluster of camera crews and out onto the road, throwing a quick glance back towards the protesters just in time to see the police make their move. In a matter of seconds the men were on the ground, then lifted and carried away by plain clothed officers. I breathed a sigh of relief; the thought of them setting themselves on fire was just too dreadful to imagine. Twenty minutes later I was sitting in a little restaurant in Trastevere telling Karen all about the protests and Tom Jones and the cardinals as she listened in disbelief. It sounded unreal when I was telling her about it; in fact it still feels unreal as I write about it now. Over the next few days I scoured the newspapers and searched online for more information about what had happened, but found only one Reuters photo of one of the men being carried away, face down, by a small army of police, and two very short paragraphs about protesters claiming to be from the Pitchfork Movement (the Pitchfork Movement, which started in Sicily to protest rising taxes and funding cuts, distanced themselves from the protesters). I never heard what happened to them, never found out who the Tom Jones guy was and will never forget that Terry Gilliam moment when a murmuration of cardinals flocked my way. This entry was posted in Europe, Italy, Photography, Travel and tagged humor, life, photography, photos, pictures, travel, writing. Bookmark the permalink. That is quite a story. 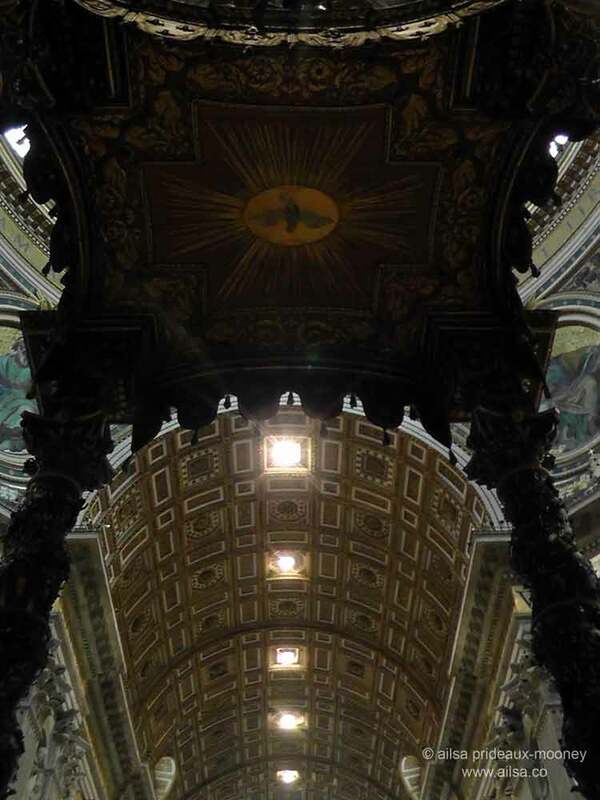 I hope it did not completely detract from the beauty of the Vatican but I would have enjoyed the intrigue too. Just thinking, if they burned themselves up who then would take care of their families? Honestly, the protest and the cardinals made up enough insanity to count as a day all unto itself. 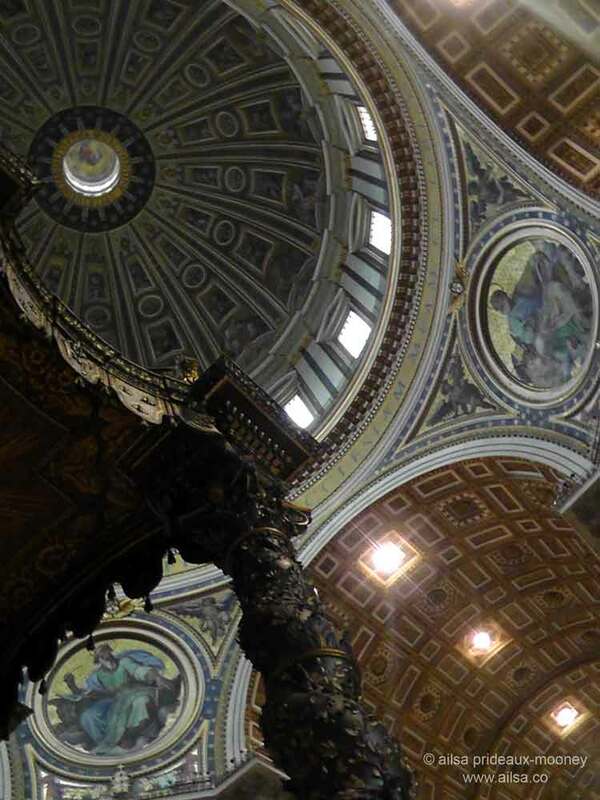 In my mind, the Vatican felt like it happened on a different day altogether, and was amazing in and of itself. Yes, I know what you mean, Kathryn, I didn’t understand how their protest would have helped their families, I can only think that maybe despair had pushed them over the edge of reason. It is very sad that such despair can occur surrounded by historical and religious wealth and purple sashed pompous men who looked quite healthy and well fed. I know, the juxtaposition between the plight of the men and the opulence and wealth of the surroundings was all too apparent, it made their anguish even more unbearable to witness. This world is so fucked up. What happened to compassion ?Desperation has replaced it. Makes me really sad in view of todays events. Another senseless repercussion. 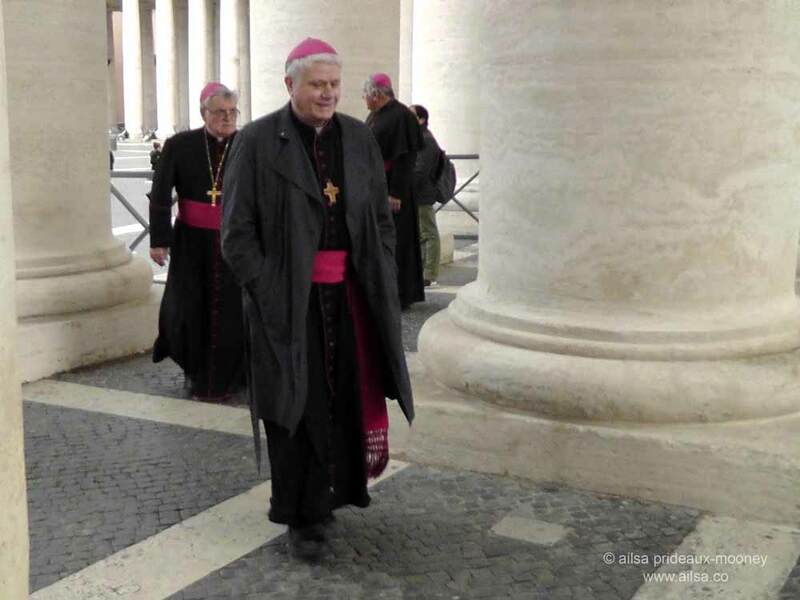 ‘a murmuration of cardinals’ – what a wonderful expresssion. Quite an extraordinary experience. wonderful photos and amazing story! Oh that just made me laugh, because my friend Karen said almost the exact same thing. We went to the Vatican a week before easter. It was a crazy scene, but not as bad as what you described. Great pictures! Wow what an experience. I thought my evacuation from the museum d’osay years ago, to a street closed off and police cars all over was exciting. Not as exciting as your story though Ailisa. hi… no i haven’t blogged about it. i should some day… i think i have a photo, but on film in storage . A flock of Cardinals, beautiful structures, eminent danger! What a day you had 🙂 Loved it! Wow! That’s quite the story, Ailsa! I’m so glad I clicked to read this post! Seriously great story, would’ve loved to experience it. I suspect some of them knew all too well, Sylvia, and craftily avoided my camera lens! It was just about the oddest day I’ve experienced. I’m still befuddled. Oh Ailsa this is hilarious, you couldn’t make it up! Brilliant, just brilliant my dear! An adventure within an adventure! Great post, Ailsa. Wow! What a day! At first I was thinking that I hope we get as lucky as you when we go. The short lines sounded like such luck. But then the protest and anguish. Yikes. 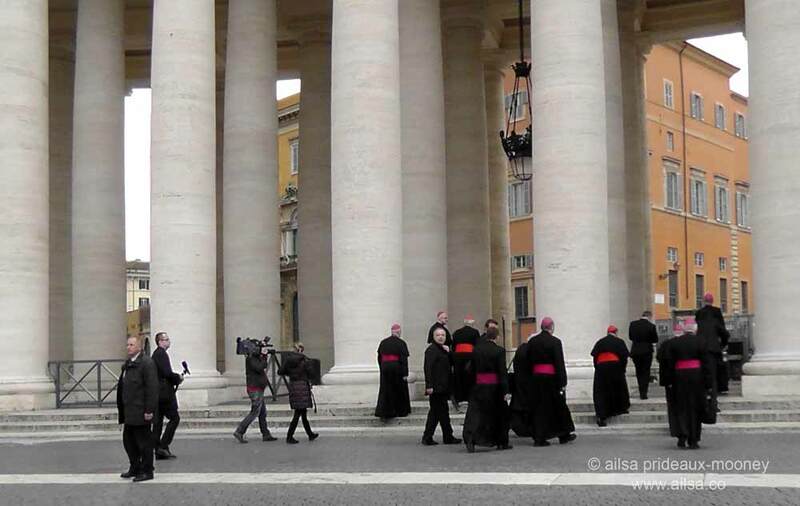 But I love the pictures you got of the cardinals and the Swiss Guard. 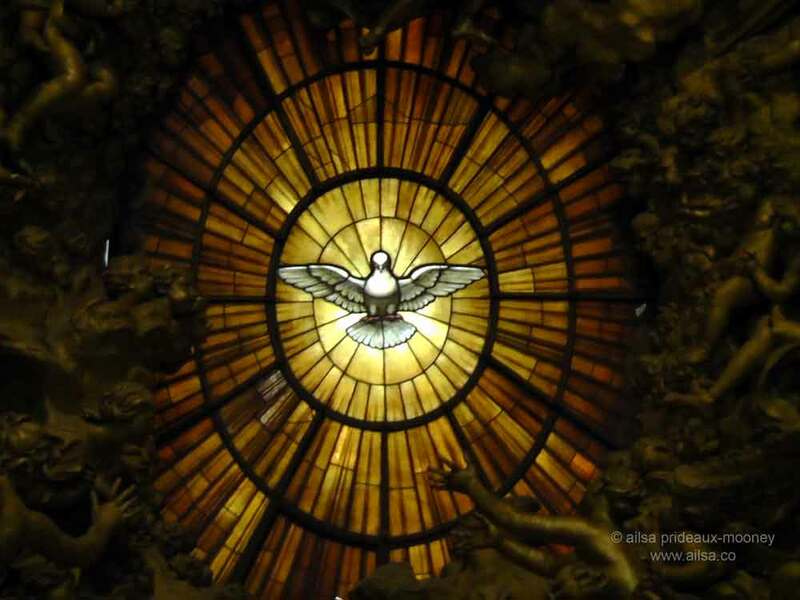 I hope I can at least capture something like that when we visit Vatican City. I know we’ll never top your story! You certainly find yourself in some bizarre situations! Love the ‘murmuration of Cardinals’ but feel so desperately sorry for the two men whose whole purpose was to house, feed and clothe their families, bless ’em. I hope you are planning to bring all these remarkable happenings together in a book one day Ailsa. Your choice of words and use of language paints such vivid pictures. What an amazing event. Hope some of those religious, pious people could help the 2 men. I really should think about putting some of my travels into book form, pommepal, just where to find the time! I’ve checked periodically since this visit to see if there was any more news reported about the protesters but I found nothing, I do so hope someone stepped in to help them. Talk about street drama and theater of the absurd. All this and art/architecture, too.